What do we know about them band then? Well, not much. 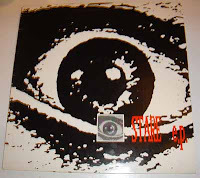 Between 1991 and 1992 this four-piece, who are possibly from Nofolk, released three EPs called Stare, Mood and Work on the Fusebox and Big Life record labels. The band members were Michael Brown, Karl Goodbody, Richard Hammerton and Derek O'Sullivan. And that's it really. All my usual sources of information have come up blank and I'm at a bit of a loss. To try and help remember this lot, I've stared a Wikipedia page for them here; as usual anyone with any useful facts and information, please feel free to add them there and we'll try and build up a better picture. What I can tell you is that this is Stare - Stare from the Stare EP and sounds a little like Thousand Yard Stare, who themselves make searching for our friends difficult and is a pretty good bit of indie pop. Update: For James and a couple of other people that have asked, this is the whole Stare EP (14mb .rar file); I'm not keen on hosting the whole of any of these records, so if there are complaints I'll take it down. Also, it's on Rapidshare so it won't last forever, get it while it's hot! I'll admit now that I'd never heard of the Nilon Bombers until I was introduced to them by my chum Steve, who's one of those people with an encyclopaedic knowledge of crap old music. I'd love to pretend he told me about them when we were fucked up after a week long opium and absinthe bender, but we were playing Facebook scrabble. How the indie have fallen. Anyway, Nilon Bombers were a Gloucestershire four-piece that knocked around for a few years in the mid-90s and, joy of joys, supported Carter USM! So that's all the indie credentials I need to put them in here. Even better, they supported them at the Melkweg in Amsterdam; possibly the most indie of all European venues, not least because of its immortalisation in a Half Man Half Biscuit song. I went to Amsterdam with work a few years back and on my last day there, I wandered around the centre of the city and popped into the Melkweg for a coffee and sandwich to kill a bit of time. The night before the Reindeer Section had played there. If I'd known the day before I'd have gone there instead of spending a tedious evening with a bunch of medical writers. Sorry. Where was I? The band were moderately famous in the mid-90s, supported Carter, played at T in the Park, released an album and a few singles and split. Latterly, Martin Williams the drummer joined a band called Silverman. As an extra bit of interest, Superstar, the EP I've robbed the title track from, was produced by legendary music bod Kim Fowley. That's a bit of music trivia to show off with. If like me you've never heard Nilon bombers - Superstar you can here. Enjoy it, it's rather good and it's one of those songs that's trapped in time because of the famous people it name checks. Of course, if you have heard of them feel free to enjoy them as well, and next time you're in Amsterdam pop down the Melkweg, they do good sandwiches. Often cruelly lumped in with the shoegazers of this world, Swervedriver were yet another Oxford four-piece with a hint of the Rides about them but they sounded far more, well, grungey really, than the other Moose-and-chums bands. The band debuted in 1990 with the classic Son of Mustang Ford EP (they had reportedly been signed to Creation after their pals Ride passed a demo tape to Alan McGee), banged out more cracking EPs over the next couple of years and played some pretty big venues (Manchester's GMEX for example) at their peak. There's a really good fansite here which tells the story far more eloquently than I can here; so much so I feel like I'm cheating putting the band on here, but I've had a couple of requests for scratchy mp3s so here we go. The band are planning a reunion tour for 2008, to cash in on their enduring popularity. If you can't wait until then, here's Swervedriver - Duel, it's got a sound to it I can't place and reminds me of something that's on the tip of my tongue, something that will no doubt come back to me, maybe it's a bit Molly Half Head. Maybe not. And as I've not put one of these in for a while, here's a youtube video of the same song. Also, you'll have to excuse me I'm having real problems with the template so the font keeps changing size and I've cocked up all the links. If anyone is a whizz at these things and wants to help, please let me know! Bleach are a criminally overlooked indie band as anyone who saw them live will attest; and the Snag EP is a great record by anyone's standards. It's pretty hard to find stuff about the band around the internet; not least because there's an American Christian rock band (now there are four words that'll strike fear into the heart of the honest indiepopper) of the same name. "The band were a four-piece, formed in 1989 by Salli Carson (vocals), Steve Scott (drums) and brothers Neil and Nick Singleton (guitar and bass respectively). Their debut ep appeared in 1990, they made some great records for the next few years, then split in 1993... Bleach were sort of lumped in with the shoegazing crowd, with bitter lyrics about betrayal and estrangement, plenty of reverb and distortion, you know the kind of thing. Singer Salli Carson often switched her vocals from a soft, almost plaintive side to bitter, guttaral tirading within the space of a verse, whilst the rest of the band washed away around her in a sea of reverb and white noise." "This quartet from Ipswich recorded three EPs inside a year's time and received an inordinate amount of British press accolades for them. Scoring an American deal with the soon-to-be-bankrupt Chameleon label, Bleach released a compilation of those EPs and then apparently disappeared off the face of the earth." Track 3 on the EP: Bleach - Bethesda is my personal favourite track of the four on the EP, it's a cracking bit of jingly-jangly indie-pop shoegazing; the kind of song I started doing all this for in the first place. Enjoy. Do Sleeper count as a forgotten indie band? You'll have to decide for yourselves on that; but what isn't in doubt is that their debut single release, the Alice EP, is as indie as they come because it's rare are hens' teeth and well, how to put this kindly..? It's not very good. No, that's unfair. The single is classic "trying to be indie" before finding out what they were actually good at material and for that reason alone needs recording here. In fact before Sleeper became the BritPop behemoth that we all know and love*, they put out three less-than-well-received EPs between 1993 and 1994. What they then became of course is the classic belt 'em out sing-alongs like "What do I do now?" and "Inbetweener", so let's enjoy this single for what it is (and fondly remember Louise Wener). What this bit of vinyl also is, is a single that the band had to release as Sleeper UK as there was a far more famous (hmmm...) American band of the same name and as is the way with these things (Verve UK anyone?) they had to chose an alternative name. And of course went on to be far more popular then their erstwhile American namesakes. This vinyl is limited to 1800 copies according to the internet (although, confusingly it's listed as limited to 5000 copies on the same site); having said that there seems to be some confusion about whether this particular version was ever released at all. Well, as it's a new year I'm not going to split hairs, again if anyone can clear up what's going on with versions and what-was-released-as-what I'd be more than happy to know. And here is Sleeper - Alice in Vain from the limited edition or non-existent Sleeper debut EP. Oh and Happy New Year! Santa and his little elves brought me loads of requests and names of new bands to hunt down so between me and Mr eBay I reckon we can carry this piffle on for a while yet!